With her leadership in professional nursing, she helped to found the Mennonite Nurses Association and served as its first President. 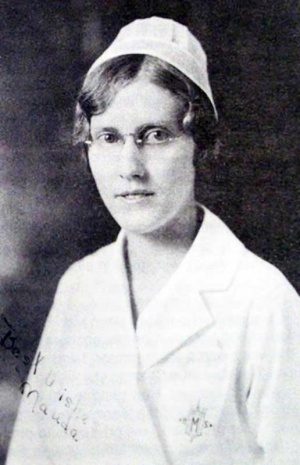 Maude Swartzendruber retired to Schowalter Villa in Hesston, Kansas, where in 1975 she completed <em>The Lamp in the West</em>, her history of nursing in La Junta. She also edited the <em>La Junta Alumnae News</em> for many years. Maude Swartzendruber was a major leader in Mennonite medical education for many years. She is buried in the Rose Hill Cemetery, Manson, Iowa. Goertz, Adalbert. "Swartzendruber, Maude Barbara Egli (1903-1990)." Global Anabaptist Mennonite Encyclopedia Online. March 2010. Web. 23 Apr 2019. http://gameo.org/index.php?title=Swartzendruber,_Maude_Barbara_Egli_(1903-1990)&oldid=85500. Goertz, Adalbert. (March 2010). Swartzendruber, Maude Barbara Egli (1903-1990). Global Anabaptist Mennonite Encyclopedia Online. Retrieved 23 April 2019, from http://gameo.org/index.php?title=Swartzendruber,_Maude_Barbara_Egli_(1903-1990)&oldid=85500.